Salame del Toro, Crannog cheese with Chilli, Jam, chutney, Olive Oil, Sweet Fig Vinegar, Gingerbread house, Gingerbread men, Tablet, Macaroons, shortbread, Oatcakes, Croutons, Cinnamon spiced nuts, Artisan roast coffee beans, Tea Pigs festive tea & a tea pot, Honey, Amaretti biscuits. 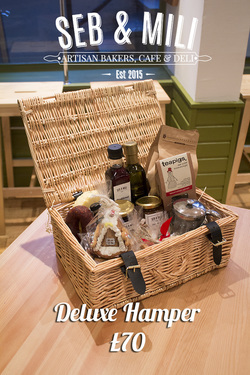 Chorizo, Isle of Mull Cheddar, Jam, Chutney, Balsamic Glaze, Croutons, Shortbread, Oatcakes, Amaretti Biscuits. Chorizo, Crannog cheese with chilli, Jam, Chutney, Balsamic Glaze, Shortbread, Oatcakes, Croutons, Teapigs festive tea & a tea pot, Macaroons, Gingerbread men. 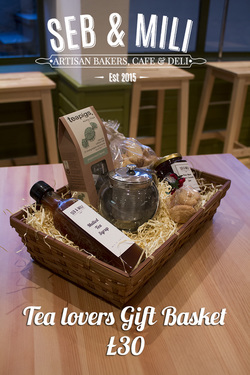 Teapigs festive tea & a teapot, jam, mulled tea syrup, shortbread, Amaretti biscuits.